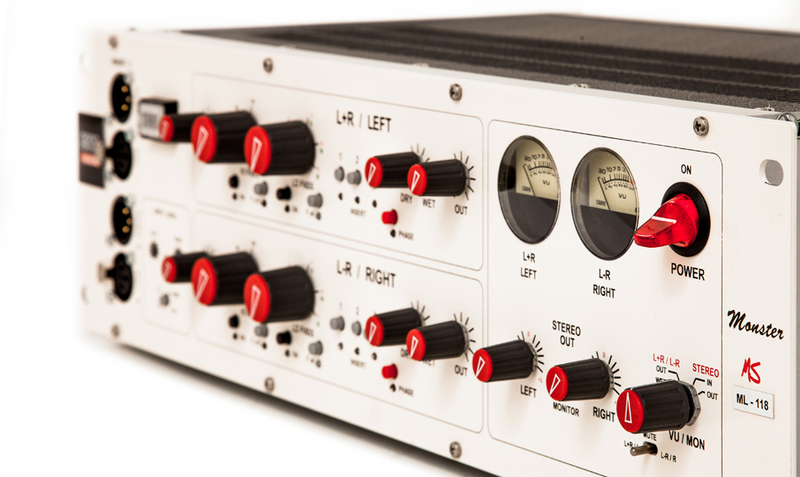 The Monster ML-118 is an advanced Mid/Side analog processor designed by REAL Audio to comply with the demands of professional recording and mastering engineers. Mid/Side processing is based on the coding of a stereo signal into two components. The ‘Mid’ channel contains the information that appears in both the left and right channels, and the ‘Side’ channel contains all the information that differs between the left and right channels. Once encoded into M/S, these two signals can be processed independently, before being decoded back into L and R channels. The M/S technique gives more control over the width of the stereo image than techniques based microphone placement techniques. The Monster MS is a code/decode mono/stereo system to be used primarily for mastering sessions but will perform outstandingly as a stereo effects unit and as a mastering console. On top of its amazing sound quality, the Monster MS unit features a unique set of functions never seen before in similar units. The L+R and L-R channels are equalized in amplitude by suitable gains at +4 dBu in order to obtain the maximum Signal/Noise and Signal/headroom ratio in the audio path. This fact is important when compressors/limiters are used as inserts in the MID-SIZE audio path. Each L+R ed L-R processing section contains a HI-PASS and a LO-PASS filter that can be selected by pressing the HI-PASS/LO-PASS button. The filters are characterized by two working bands selected by pressing the corresponding buttons (Fx10 and Fx4), the cut off frequency is adjustable by a potentiometer. HI-PASS filter parameters: Range 20-250 Hz or 200-2500 Hz (F x 10 button pressed). LO-PASS filter parameters: Range 1-5 KHz or 4-20 KHz (F x 4 pressed). Three different INSERT points are available to connect outboards. INSERT 1 and 2 are available on the DB-25 connector on the back panel. This connection is useful for effects that are often used in the audio path. INSERT 3 connectors are located on the front panel (XLR connectors). This is useful for on the fly outboard connections. The unit provides a Phase Inversion button to reverse the phase of the wet signal. The wet and dry signals can be mixed together. 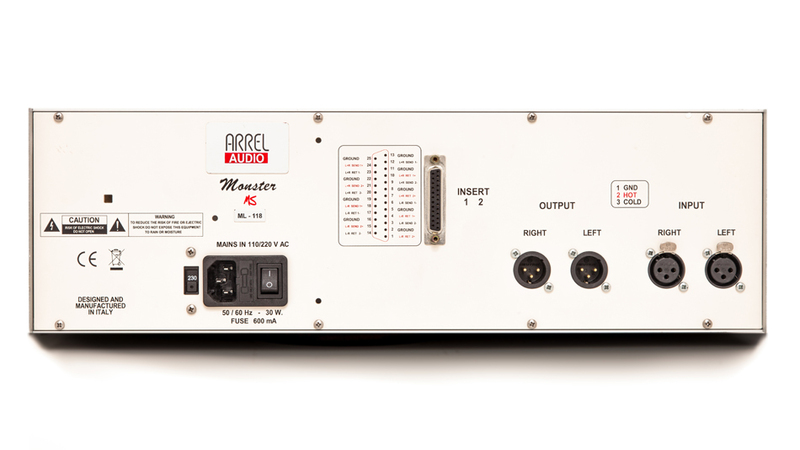 A bypass switch (illuminated by a LED ) can turn the device into a Stereo unit, making the Monster MS an effects unit perfectly integrated in an external signal processing chain. The Monster MS features 2 multifunction VU meters that the user can set to display a variety of important data such as: input stereo level, post L+R/L-R levels, post L+R/L-R processing level, L+R/L-R output level and output stereo level. Channel Gain L+R: from -10 to +6 dB, L-R: from -22 to +4 dB. LO-pass with 2 frequency ranges (1-5kHz and 4-20kHz). Calibration button and Calibration trimmer for non standard input levels. Output level pot +4dBu (max +28dBu). Master/Monitor section: 1 x red LED (Monitor), 2 x Electromechanical VU meters (LED Backligh). 2 x Balanced XLR male for Insert 3 (Return L-R). Rear Panel Input Connectors 2 x Balanced XLR female. Rear Panel Output Connectors 2 x Balanced XLR male. Rear Panel Insert Connectors 1 x DB25 female for Insert 1 and-2 (Send & Return 1, Send & Return 2 )).